Some Iranians have been watching the events in Kyrgyzstan with interest, while drawing parallels with the post-election crisis in their own country. They have expressed envy over what they see as the success of the Kyrgyz opposition to oust the government and frustration over the failure of Iran’s opposition Green movement to bring changes. Reports about the Kyrgyz developments and videos of the unrest were widely shared among Iranians on Facebook and also on Farsi news websites. Former Vice president and blogger Mohammad Ali Abtahi, who was among those jailed in the post-election crackdown, wrote on Facebook that he has been following the events in Kyrgyzstan closely. “It’s strange how in one afternoon they managed to change the government,” wrote Abtahi, who said he was in Bishkek several years ago. “The people of Iran must watch this, they could, we can too,” wrote Minou. 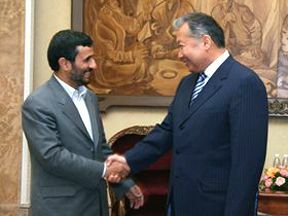 On the popular web portal “Balatarin,” bloggers noted that Kyrgyz President Kurmanbek Bakiev was among those heads of state that had congratulated Iran’s President Mahmud Ahmadinejad following his disputed reelection last year. They posted a link to Bakiev’s message.